A Slovac illustrator who's worked on books such as Lewis Carrol's "Alice In Wonderland", Kallay has an incredibly bizarre imagination. His monumental surreal creatures lumber about equally strange landscapes. "Dušan Kállay is entitled to be considered the most well known and the most acknowledged Slovak artist abroad. The number of books illustrated by him, re-editions and editions in foreign languages included comes to two hundred. 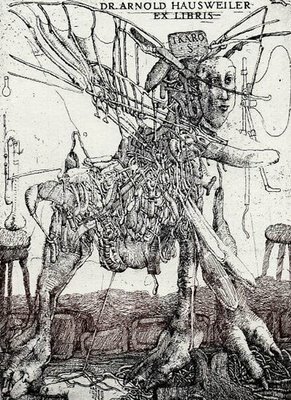 The works of Dušan Kállay are a final form of an absolute visual seeing and perception of the world supported by an extraordinary imagination and sense for fantasy applied in bizarre compositions of figures, animals and birds in a labyrinth of endless twisted structures documenting both the playfulness and a mysterious character of the artist." quote taken from here. this guy is by far the best and most imaginative artist on this page. really awesome stuff, I hope I can see more.